Binance Research, the market analysis arm of global cryptocurrency exchange Binance, has released a report analyzing cryptoasset cycles, saying that data on the correlation cycles may support the notion that the cryptomarket has already bottomed out. 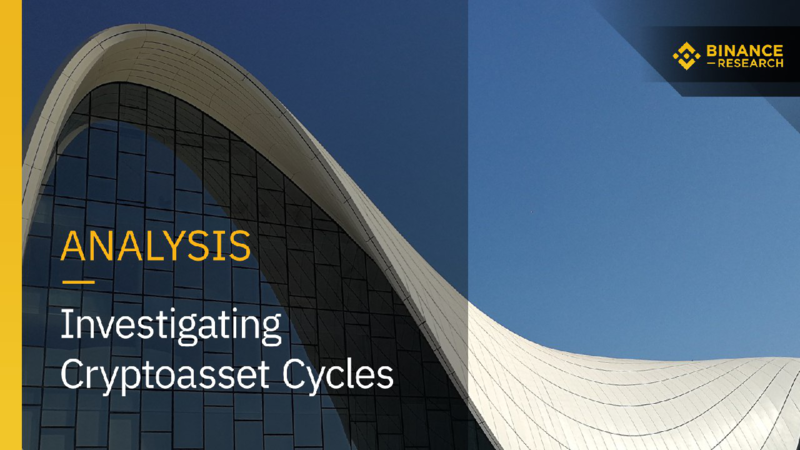 Binance Research’s report, titled “Investigating Cryptoasset Cycles,” takes a look at changes in cryptoasset correlations based on market structure and reveals insights on cryptoasset movements in comparison with other major markets. This report also reveals major insights into behaviors of many participants and indicators in the cryptoasset market, and how different they are from the characteristics seen in other major markets around the world. - Price co-movement of cryptoassets is quite high. - About 7% of cryptoassets are held by institutional investors, compared to the estimated 90% institutional holdings proportion for the U.S. stock market. - Cryptoassets have turnover rates that are five times higher than that of the U.S. stock market. “High correlation among cryptoassets can be summed up by an ‘if you can’t beat ‘em, join ‘em’ mentality; during a unilateral trend (late bull or early bear phase), excess returns denominated in USD would become harder to capture, so it becomes easier for market participants to just ride the market waves,” according to the report.